Spanish Judge Baltasar Garzón, the Spanish prosecutor who made a name for himself a decade ago in his efforts to prosecute Chilean ex-dictator Pinochet, has ordered the exhumation of mass graves relating to the Spanish Civil War. Garzón claims he has jurisdiction over crimes against humanity committed in the 1930s because enforced disappearance is a continuing crime. In other words, if someone disappeared decades ago, the crime continues till this day. He cites ‘permanent illegal detention without identification of location, in the context of crimes against humanity’. The issue may be of some interest to the International Criminal Court, whose jurisdiction begins on 1 July 2002. Many have examined whether it might peer into the past, using the gambit of 'continuing crimes'. This might well apply not only to the crime against humanity of enforced disappearance but also to the war crime of moving settlers to an occupied territory. The issue was left somewhat unresolved at the Rome Conference, when the International Criminal Court statute was adopted. Using information provided by churches and city halls around the country, as well as the Catholic hierarchy, Garzón has compiled a list of some 114,266 victims. , according to the court document. These individuals were on, or linked to the losing Republican side in the civil war. State prosecutors take the position that an Amnesty Law of 1977 covers the disappearances. The painting is of course Picasso's great Guernica, portraying the 1937 bombing of the Basque town. 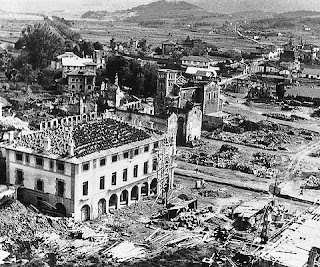 The photo shows the town after the bombing. Thanks to Eadaoin O'Brien, and to Tara Smith for the photos.